A 47 year old patient came to our office who was suffering from chronic back pain for past few years. 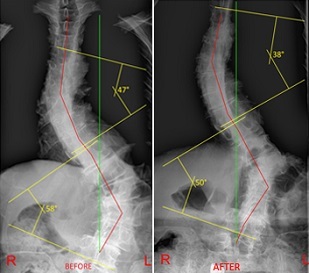 After taking full spine x-rays, patient for the 1st time finds out that he has scoliosis, his upper back curve showed 18°. After intensive care for 4 weeks patient’s post x-rays showed reduction in upper back to 7° approximately 50% improvement. Patient is still working on reducing his curve to maximum potential. A 65 year old patient came to our office who was suffering from scoliosis and chronic pain for years. After taking full spine x-rays his upper back curve showed 47° and lower back was 58°. After intensive care for 4 weeks patient’s post x-rays showed reduction in upper back to 38° and lower back to 50° approximately 20% improvement. Patient is still working on reducing his curve to maximum potential. A 7 year old boy came in to our office with severe neck pain (10/10) without any history of injury. 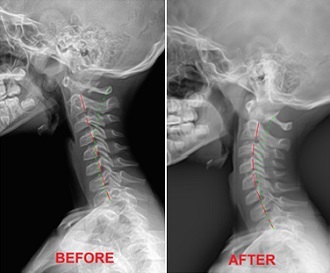 We took cervical x-rays and found forward head posture, which what was causing his neck pain. 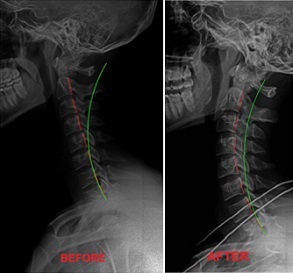 After 9 visits of Corrective Spinal Rehabilitation at Queens Scoliosis Center patient improved 80% structurally. A 23 year old patient came to our office complaining with severe pain the neck and radiating to his arm without any history of injury. We took cervical x-rays and found forward head posture, which what was causing his neck and arm pain. 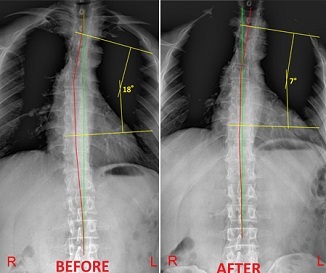 After 12 visits of Corrective Spinal Rehabilitation at Queens Scoliosis Center patient improved 85% structurally and his pain was completely gone.